CEATEC Japan 2016 Day 3: Honda set up a 3D printing workshop in a 19th century Japanese house, because, why well not? After analysing the latest trends with some of the best and most curious inventions, like the ORIZURI and FORPHEUS, on CEATEC Japan 2016 Day 1 and Day 2, let's now check out in detail some of the most important booths here at the fair. 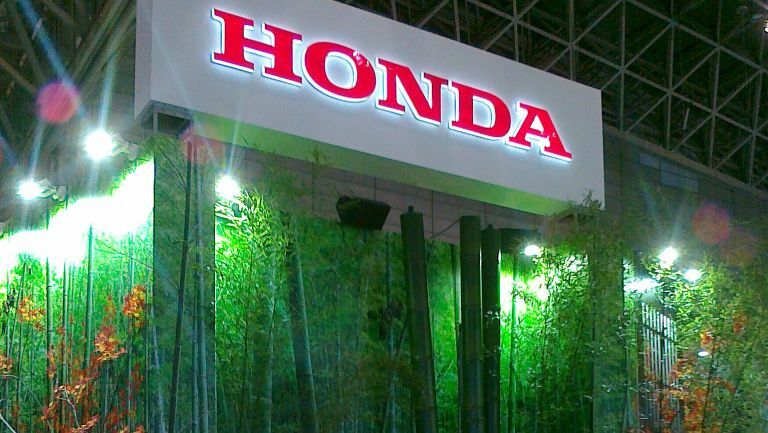 For some reason, Honda presented itself in a booth that was designed to be like a typical 19th century Japanese house! Inside, however, there was nothing but its new 3D printable car, which the company is expecting to be a real revolution in the car market very soon. Not only in Japan but, in my opinion, even in our markets, especially in terms of allowing us to reprint at home all the broken parts of our car. Just imagine if, tomorrow, your car broke down and needed new parts. Instead of having to order them in, sometimes from the other side of the world, to get it fixed, you could simply download a schematic and print it yourself at home. Enough Said. Plus, the characterization of the booth is really unique and beatiful and, even after attending many of these shows, I have never seen something so huge and peculiar. This year, Fujitsu's booth is REALLY huge, with the managment clearly looking to gain more share in different segments of the market (from the education to the AI). While in our market Fujitsu is not a fundamental brand, here in Japan the name is far more well-known. At CETEAC 2016 Fujitsu has come to bat with some really interesting and profitable inventions in my opinion. The first day I have talked about its instant translator, and on the second about the retinal imaging laser eyewear. Today I talk about another one, the “SELF TERMINALS”, inventions which will be implemented even in other brands` machines. An example is the instant search engine technology based on `Line of Sight` sensors, which work by the movement of our eye in front of a menu, choosing for us (and giving suggestions) the things we might like. Simply amazing! Just imagine being able to have that sort of technology in a restaurant, with you being able to search and select thing from a menu simply with your eyes. An another thing that surprised me it is the ONTENNA, a device that can be placed in our hair that translate audio waves into vibrations. Good not only for deaf people but also, in the future, for augmented reality. Looking around Fujitsu's booth, it also seems like that research on AI is very important for the company. For examplew, at CEATEC this year there were a lot of interesting developments for traffic, with the SPATIOWL capable of predicting and avoiding traffic jams. At the moment nothing much (substantial) has been said about its integration into our cities, but it will be implemented eventually. 70% of these forward thinking and pioneering inventions stem from internal developers, with the other 30% coming from university reasearch and developmeny teams. I must say, having tried most of them even today, Fujitsu really impressed me with its inventions and capability to bring them to market very soon. Even if in the west this holding is mainly known for air conditioning, in Japan the `water caltrop` is a real beast, so powerful in fact that it has a bank of its own, and is the first commercial bank of Japan! It is a company so powerful and structured that it also controls the Japanese insurance market, the savings of many citizens and the production of many home appliances shown here. This year – for the first time at CEATEC – Mitsubishi's bank branch is also here, to finance R&Ds and inventions even from direct competitors, to gain shares in IP rights and profits, and obviously make even more money. As for Mitsubishi's internal R&D, well it seems very focused on driving assistance technology, with a particular attention on cloud functionality. The only concern that comes to mind is: once all these integrations between ours smartphones, computers, cars, satelites and more are made real, who will control this huge cloud? If you like news and reportage from Japan, however, then you can always follow us in our section 'Made in Japan' on T3.com.